Butterfly Reflections, Ink. : A trio of cards and my first post! A trio of cards and my first post! Erica here with my first blog post as part of the Butterfly Reflection Inks design team! I’m so thrilled to be part of this team and hope to be a great source of inspiration and enabling you a lot along the way. A big thank you to Vanessa for giving me this chance! I’m going to dive right in with my post as it’s a rather big one. Sorry about that, but when you get excited in the craft room and are on a roll, there is no reason for stopping it. Or at least that’s my motto. One thing I really like doing, and I will mostly definitely be guilty of this for my BRI blog posts, is using the same stamp set but make very different cards. I think it is so much fun to see just how different a few cards can look just by changing the colour scheme, the medium with which we colour an image with or a few different techniques used to make the actual cards. I personally LOVE heat embossing and use it a lot. Like a lot-a lot. In fact, I have done it on all three of my cards for today’s post! The stamp set I’ve used is Kind Soul from WPlus9 and it’s such a lovely stamp. I absolutely adore it. I’ve also got the coordinating diecut for this set as I’m not the most patient fussy-cutter, that’s one of my least fave things to do in the craft room. Righty-o, let’s get to it then. For my first card I stamped the image on previously anti-static dusted Strathmore Bristol Vellum water colour card stock with VersaMark ink and sprinkled Altenew’s Rose Gold Crisp Embossing Powder all over it, shook off the excess and set it with my heat tool. 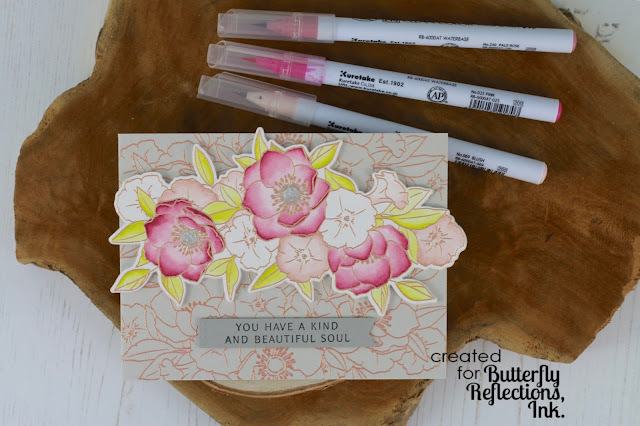 Whilst I had the stamp in my MISTI, the embossing powder and my heat tool at the ready, I also stamped it twice, in different spots, on a light grey card stock and heat embossed that too in the same Rose Gold embossing powder. This piece, which is actually the whole card base, I set aside and got my Zig Clean Color markers out to colour in the image itself. I wanted to keep this one almost vintage like, so I used the Blush marker with a bit of Pale Rose and Pink for details and contrasts. Light greens made up the colours for the leaves and this I diluted quite a lot. When I was happy with the colouring, I set it aside to dry whilst I kept working on the rest of the bits for the card. With the coordinating diecut I cut a matching piece out of double-sided adhesive foam sheet. This stuff is a must have in my opinion but the particular one I use, I'm not sure what the brand is as I got it from a craft shop I used to go to when I lived in Denmark. It cuts like butter and adds effortless layers and dimension to any project. Absolutely worth it’s weight in gold. I have a big stash in different thicknesses (and I'm totally ready to go back to Denmark JUST for this stuff if I can't find it anywhere else, it's THAT good!) for the flower backing, I used one that is 1.9mm thick. 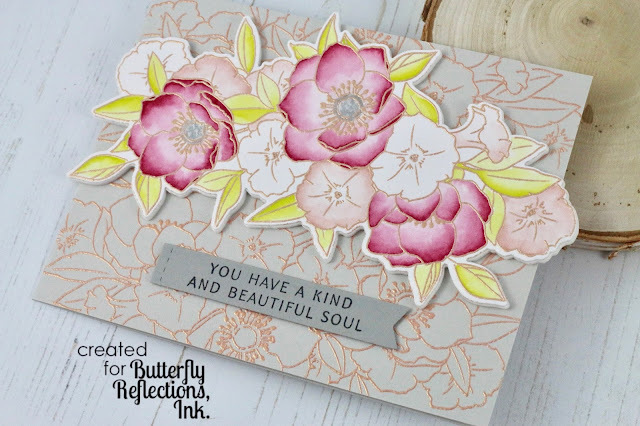 I wanted to use the sentiment ‘You have a kind and beautiful soul’ from the stamp set, and on a perfectly sized banner (Stitched Sentiment Strips from MFT) I stamped it with Memento Black Tuxedo ink. This banner got a bit of that good ole’ foam tape on the back too, but this one was only 1mm thick. After the flower piece and the foam sheet piece were adhered to each other, this is a process worth taking your time over to get the alignment right, it was a quick job of adding that and the banner to the card base and hey, presto! The card was done! For card no2 I again used my Zig Clean Color markers but this time I used very bright and strong colours! 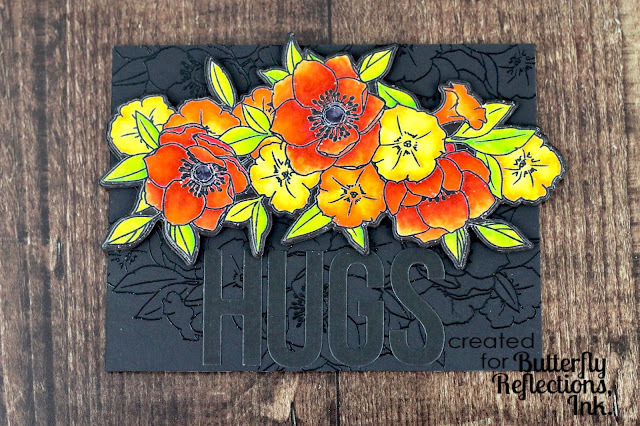 I really wanted the flowers and the leaves to pop as I was planning on putting it on a black card base for a very different style card that I usually make. On my first card, I used lots of water to dilute the colours and make them pale. For this one, I barely used a drop of it, instead opting to blending the colours together right on the image. I absolutely love how bright and happy this card is despite the black background. Oh and the image itself is stamped in Memento Black Tuxedo ink and then again with VersaMark ink before being heat embossed with clear embossing powder. As I wanted some interest to the background, and not just a plain black one, I again stamped the image twice in different places, with the VersaMark ink. This time I used clear embossing powder instead of a coloured one, it gives some interest without overpowering the whole thing. It already has a lot of ‘drama’ for a card, no need to go over-kill, right? For this card, I didn’t do it directly on the card base though. That is plain white card stock to make it easier to write a message inside the card itself. The background piece is an A2 card sized panel cut out of Lawn Fawn Black Licorice and it’s my favorite black card stock. It’s smooth, super black and very sturdy. I would love to have every single colour of their card stock in my stash to be honest, it’s so fabulous and the colour range is great! 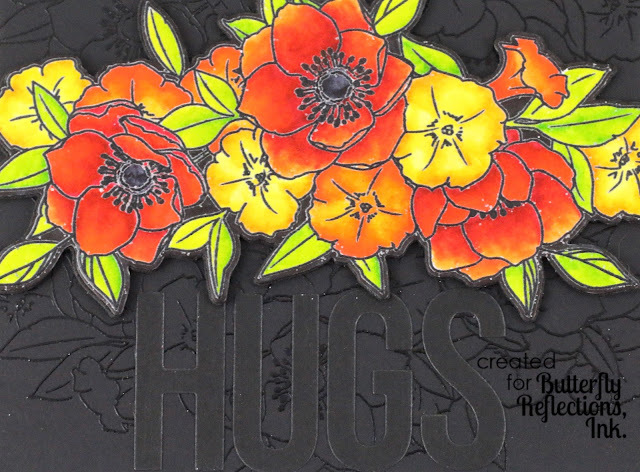 Sentiment wise I didn’t want anything that took away too much from the flowers and the Big Hugs dienamic from MFT Stamps did just the trick! I cut this out of linen textured black card stock and added it directly to the background. No foam tape for this element. The flowers on the other hand, were adhered to the card with some black fun foam, which I also cut out using the coordinating diecut, and I also decided to fill in any white gaps with my black Zig Marker. Because this card wasn’t dramatic enough, clearly...! My third and final card is a labour of love. This took me nearly three days to finish colour in. Ok, so admittedly I only did a little bit every day because I am still pretty new to coloured pencils on Kraft card stock and didn’t want to overdo it and risk ruining the whole thing. When you spend so much time on one piece as you tend to do with coloured pencils, it’s not so strange if you start to feel protective of your efforts after a while. Whilst this wasn’t my first attempt, it was only my second but I’m quite pleased with how it turned out. I will be practicing a lot more with my coloured pencils this year though, that’s one of my crafty goals set for 2018. I used a lot of white as a base for the other colours, both to make them pop a bit more and for easy blending. The pencils I have are the Polychromos and I use this sharpener to keep them razor sharp. It was recommended to me to get a few extra white pencils as you tend to use a lot of them so I have two spare ones as back up, you can get yours right here. One thing that I learnt the hard way is to NOT heat emboss your image first and then colour it in with pencils. I scratched off so much of my embossing powder in different areas of the image I toyed with the idea of trying to heat emboss another layer on top but figured it would be very difficult to get it just right so I skipped this. However, next time, I will stamp the image with another colour ink, leave the stamp in my MISTI, colour the image in with my pencils and then heat emboss it over afterwards. For finishing touches I cut out a Lawn Fawn Outside In Stitched Rectangle die using the biggest size die, in a metallic purple, textured card stock I have had in my patterned paper hoard for years and years. I also cut out a 'thanks' in the same card stock, using the Scripty Thanks die also from Lawn Fawn. To create a white shadow to help the word stand out a little more, I also cut out one more ‘thanks’ in white fun foam. These two pieces I added together with some Multi Media Matte adhesive. 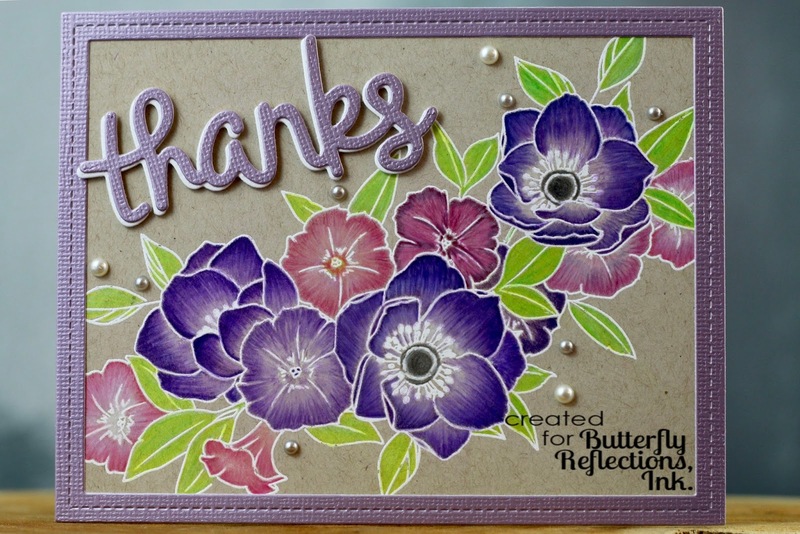 This card also got a white card base, the background panel was added directly to it with double sided tape and then the frame and the layered ‘thanks’ were adhered too. 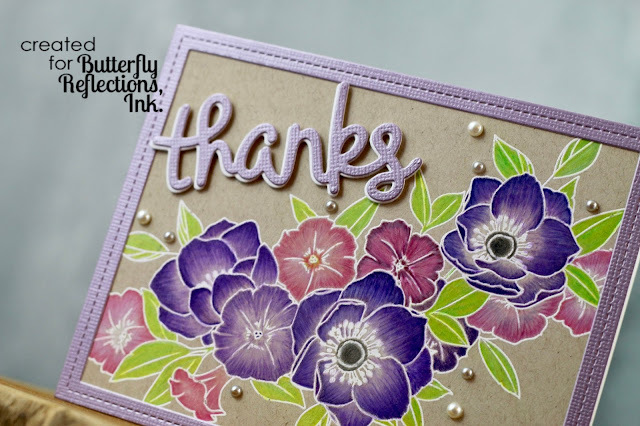 A few half-pearls in muted lilacs and off-white were the final touches to this card. Phew! If you have made it this far, give yourself a pat on the back, you sure are a trooper! That’s it from me today, but I will be back every Monday this month with more inspiration, enabling and lots of jibber-jabbering. Until then, Happy crafting! Absolutely gorgeous! I love your work!! Thank you so much, Jo Ann! It means a lot to me that you think so! Thank you! I'm so glad to hear that you enjoyed the post and are looking forward to more. Best of luck with your coloured pencils on Kraft, let's hope we both reach our goals this year! These are all so beautiful! Absolutely gorgeous! Looking forward to more wonderful posts!! Oh, thank you, Ashwini! I'm so glad to hear you like these cards and are looking forward to more. I hope I will live up to your expectations!